David M. Binkley, Ph.D., P.E. Positron emission tomography (PET) front-end architectures, detectors, and electronics, including statistical and noise analysis. Designs are in Siemens PET/CT medical imaging scanners. Biomedical EEG sensor/cooling array and CMOS, mixed-signal integrated circuit implants for detection and suppression of epilepsy, in collaboration with Yale School of Medicine, UNC Charlotte, and ITN Energy Systems, Inc.
Analog and mixed-signal integrated circuit design in CMOS processes. Methods for optimizing analog CMOS design for bandwidth, gain, thermal noise, flicker noise, DC mismatch, power consumption, and other performances. Author of Tradeoffs and Optimization in Analog CMOS Design, John Wiley and Sons Ltd., ISBN 978-0-470-03136-0, June 2008. Modeling and simulation for analog and mixed-signal circuit design, including the development of custom C and Excel software. Analog, mixed-signal, and digital circuit design for printed-circuit boards. Micropower, CMOS, mixed-signal integrated circuit design for battery powered consumer products.esigns are in wireless and buried-wire pet containment products manufactured by Pet Safe. Teaching, mentoring, and advising undergraduate and graduate students in electronic circuit analysis and design, and analysis and design of CMOS analog and mixed-signal integrated circuits. Ph.D., Electrical Engineering. The University of Tennessee, 1992 (while working full-time). Dissertation: "Analysis and Development of Non-Delay-Line Constant-Fraction Discriminator Circuits, Including a Fully-Monolithic CMOS Implementation." M.S., Electrical Engineering. The University of Tennessee, 1984 (while working full-time). Thesis: "A Low Noise 45 - 75 MHz Phase-Locked Loop Frequency Synthesizer for a High Performance Communications Receiver." B.S., Electrical Engineering. The University of Tennessee, 1978 (COOP student). Study emphasis: Analog and digital circuit design. Engaged in research and design of front-end, analog and mixed-signal circuits for silicon photomultiplier (SiPM) based detectors in positron emission tomography (PET) imaging systems. These systems create images of biochemical function within the human body for evaluating diseases of the heart, brain, and whole body. Mentor University of Tennessee undergraduate and graduate student interns. Taught core, undergraduate, sophomore circuits' classes, including DC and AC circuit analysis, AC power analysis, and Laplace analysis for transient and frequency response. Taught undergraduate and graduate classes in analog CMOS integrated circuit design, including MOS modeling, bias analysis, small-signal modeling, SPICE simulation, and design of transmission gates, current mirrors, amplifiers, and complete operational amplifiers. Taught undergraduate and graduate classes in analog system design, including the analysis and SPICE simulation of operational amplifier based amplifiers and active filters. Taught graduate classes in advanced analog CMOS integrated circuit design, including design in weak, moderate, and strong inversion for the optimization of bandwidth, gain, thermal noise, flicker noise, DC mismatch, power consumption, and other performances. Received the Tau Beta Pi "Most Influential Teacher of 2001" award for the college of engineering. Conducted research, as principal investigator, for NASA JPL on micropower, analog CMOS circuits and for DARPA on design and testing methodologies for mixed-signal integrated circuits. Graduated, as the major advisor, three Ph.D. students and thirteen M.S. thesis students. Published a book and papers on the optimization of analog CMOS design and other research topics (please see Book published, Journal papers, and International conference papers). Gave tutorials or invited plenary talks at international conferences and major universities in the U.S. and Europe (please see Tutorials, Invited plenary talks, and Invited talks). Active in departmental service, frequently serving in the department Promotion, Review, and Tenure committee. Active in college service, including as the President of the College of Engineering Faculty. Active in university service, including as a member of the Faculty Executive Committee and Faculty Council. Active in the department of music, including as a member of the Faculty and Faculty/Student jazz ensembles. Developed, with associates, a front-end, mixed-signal, 0.5-μm CMOS integrated circuit for PET medical imaging systems manufactured by Siemens (please see description/photomicrograph in Commercial integrated circuits designed). Developed power efficient, low-noise, CMOS integrated circuit preamplifiers for avalanche photodiode (APD) based PET medical imaging systems. Assisted in the development of microPET, small-animal (preclinical), PET imaging systems manufactured by Concorde Microsystems, Inc. Developed, with associates, micropower, battery-operated, CMOS integrated circuit receivers for wireless and buried-wire pet containment systems manufactured by Pet Safe (please see description/photomicrograph in Commercial integrated circuits designed). In 2007, the consumer product activities for Pet Safe became part of XYZ Microsystems, Inc. Developed low-distortion, low-pass filters used in the companion transmitter chips for wireless and buried-wire pet containment systems manufactured by Pet Safe. Developed front-end analog and digital electronics used in PET medical imaging systems manufactured by Siemens. Developed, with associates, a front-end, mixed-signal, 2-μm CMOS integrated circuit providing energy, position, and time measurement from 8 x 8 element BGO scintillation detectors used in PET medical imaging systems. Developed patented (U. S. patent 5,396,187) non-delay-line constant-fraction timing discrimination circuits, low time dispersion (< 0.5 ns) comparators, wideband (100 MHz) continuous-time filters, and gated-baseline restorer auto-zero circuits. Led the development team consisting of a senior engineer, a university faculty consultant, and university students. Received, as principal investigator, a $500,000 Small Business Innovation Research grant from the National Institutes of Health (NIH) for research and development of the custom CMOS PET front-end integrated circuit described above. Developed discrete PET front-end circuits (prior to development of custom CMOS integrated circuits) containing discrete devices, wideband operational amplifiers, operational transconductance amplifiers, flash A/D converters, and ECL logic devices. Developed discrete time-of-flight PET front-end electronics including a subnanosecond time-to-digital converter having 62.5-ps timing resolution. Circuitry includes low metastability, ECL synchronization logic combined with fast analog time-to-amplitude conversion coupled to flash A/D converters. Received doctorate degree in electrical engineering while working full time. Dissertation research included invention of patented non-delay-line time derivation circuits, Monte Carlo simulation of statistical timing resolution, and implementation of integrated CMOS time derivation circuits. Developed analog and digital circuits for nuclear power plant vibration and radiation monitoring systems. Developed a radiation hardened, accelerometer preamplifier (for 2 x 108 rad gamma dose) used in U.S. nuclear power containment buildings. Developed low-noise, charge-sensitive preamplifiers for ion-chamber instrumentation. Developed acoustical monitoring systems for loose-parts detection, relief-valve flow monitoring, diagnostic testing of rotating machinery, and materials testing. Developed computer controlled radiation monitoring systems containing electrometer, analog-to-digital conversion, and digital interface circuits for the digital VME buss. Received master's degree while working full time. Independent from work, developed a low phase noise (-145 dBc/Hz at 20 kHz carrier offset), 45 - 75 MHz PLL frequency synthesizer for a high dynamic range communications receiver. Low phase noise is required to minimize receiver reciprocal mixing noise. 2014 - present. Adjunct professor. Department of Electrical Engineering and Computer Science, University of Tennessee, Knoxville, TN. Teach graduate classes in analog CMOS integrated circuit design, including MOS modeling, bias analysis, small-signal modeling, SPICE simulation, and design of transmission gates, current mirrors, amplifiers, and complete operational amplifiers. Co-advise one Ph.D student. May - July, 2007. Visiting scientist. Institute for Electronic Design Automation (EDA) for the International master's program in communications engineering, www.master.ei.tum.de, Technical University of Munich, Munich, Germany. Taught class mentioned above. 1998 - 2000. Adjunct associate professor. Department of Electrical and Computer Engineering, University of Tennessee, Knoxville, TN. Co-taught, with Dr. Chuck Britton of Oak Ridge National Laboratory, graduate classes in performance and design of RF wireless circuits, including topics on transistor-level noise analysis, phase noise analysis, and the design of low phase noise, PLL frequency synthesizes. Front-end, CMOS chip for PET medical imaging scanners manufactured by Siemens. 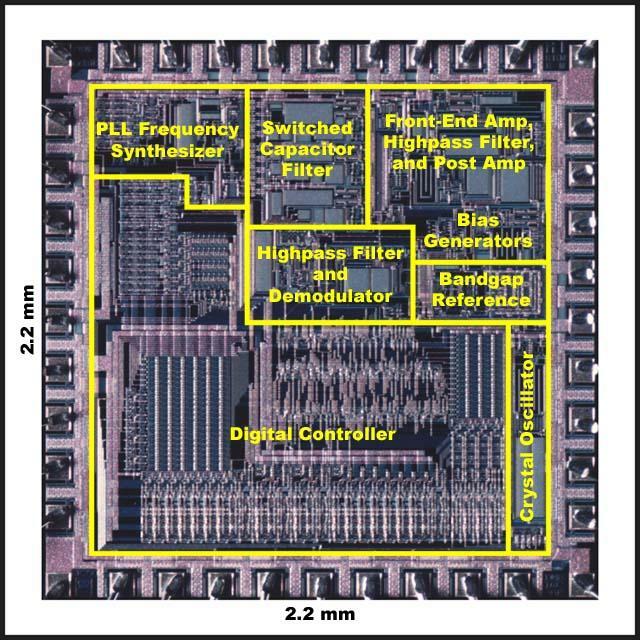 This chip, developed in 0.5-μm CMOS, contains wideband (100 MHz), variable-gain (10:1), differential amplifiers (J. M. Rochelle), a constant-fraction discriminator time derivation system (D. M. Binkley), a 100-ps resolution time-to-digital converter (B. K. Swann), continuous-time position/energy shaping filters (J. M. Rochelle), a bandgap bias circuit, D/A converters, and support circuits. The constant-fraction time derivation system is reported in D. M. Binkley et al., IEEE Transactions on Nuclear Science, June 2002, and U. S. Patents 6,822,506 and 5,396,187. 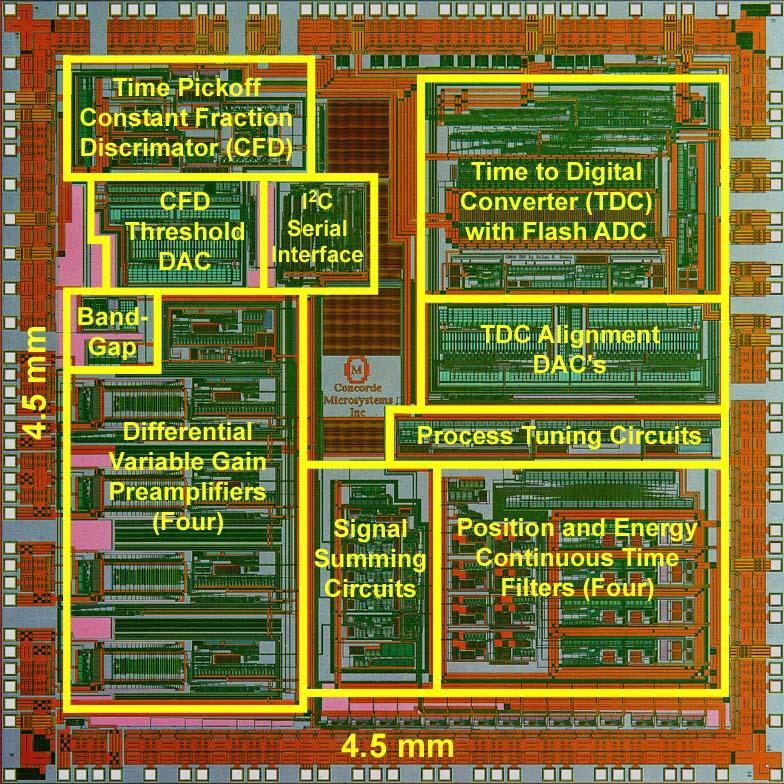 The time-to-digital converter is reported in B. K. Swann et al., IEEE Journal of Solid-State Circuits, November 2004. Led the design team of D. M. Binkley, J. M Rochelle, and B. K. Swann at Concorde Microsystems, Inc.
Micropower, battery operated, CMOS receiver chip for wireless pet containment systems manufactured by Pet Safe. This chip is a micropower (80 μA), battery-operated, VLF (10-82 kHz), direct-conversion receiver, containing a low flicker-noise preamplifier, automatic gain control (AGC), I/Q mixer, I/Q baseband intermediate frequency (IF) stages, phase locked loop (PLL) synthesized local oscillator, and I/Q sigma-delta A/D converters. This chip is reported in D. M. Binkley et al., IEEE Journal of Solid-State Circuits, March 1998. This chip receives modulated, three-dimensional magnetic field signals using methods reported in U. S. patents 7,142,167 and 6,879,300. Assisted in the design at Concorde Microsystems, Inc. by J. M. Rochelle who designed the I/Q sigma-delta A/D converters. Micropower, battery-operated, CMOS receiver chip for buried-wire pet containment systems manufactured by Pet Safe. This chip is a micropower (27 μA) receiver containing preamplifier, switched capacitor elliptic lowpass filter, PLL, crystal oscillator, band-gap reference (J. M. Rochelle), and digital algorithm circuits (J. M. Rochelle and L. Clonts). Designed by D. M. Binkley, J. M. Rochelle, and L. Clonts at Concorde Microsystems, Inc. Over 4-million of these chips have been manufactured. D. M. Binkley, Tradeoffs and Optimization in Analog CMOS Design, John Wiley and Sons Ltd., ISBN 978-0-470-03136-0, hardback, 632 pages, June 2008. (As of September 7, 2009, the associated Excel spreadsheet design tools developed by the author are in use in 68 companies and company locations, and 72 universities and government research laboratories, in 35 countries). S. Mohan, A. Ravindran, D. Binkley, and A. Mukerjee, "Power Optimized Design of CMOS Programmable Gain Amplifiers," Journal of Low Power Electronics, vol. 2, May 2006, pp. 259-270. D. M. Binkley, B. J. Blalock, and J. M. Rochelle, "Optimizing Drain Current, Inversion Level, and Channel Length in Analog CMOS Design," Journal of Analog Integrated Circuits and Signal Processing, vol. 47, April 2006, pp. 137-163. D. M. Binkley, C. E. Hopper, J. D. Cressler, M. M. Mojarradi, and B. J. Blalock, "Noise Performance of 0.35-μm SOI CMOS Devices and Micropower Preamplifier Following 63-MeV, 1-Mrad (Si) Proton Irradiation," IEEE Transactions on Nuclear Science, vol. 51, no. 6, December 2004, pp. 3788-3794. B. K. Swann, B. J. Blalock, L. G. Clonts, D. M. Binkley, J. M. Rochelle, E. Breeding, and K. M. Baldwin, "A 100-ps Time-Resolution CMOS Time-to-Digital Converter for Positron Emission Tomography Imaging Applications," IEEE Journal of Solid-State Circuits, vol. 39, no. 11, November 2004, pp. 1839-1853. B. K. Swann, J. M. Rochelle, D. M. Binkley, B. S. Puckett, B. J. Blalock, S. C. Terry, J. W. Young, M. S. Musrock, J. E. Breeding, and K. M. Baldwin, "A Custom Mixed Signal CMOS Integrated Circuit for High Performance PET Tomograph Front-End Applications," IEEE Transactions on Nuclear Science, vol. 50, no. 4, August 2003, pp. 909-914. S. C. Terry, J. M. Rochelle, D. M. Binkley, B. J. Blalock, and D. Foty, "Comparison of a BSIM3V3 and EKV MOST Model for a 0.5-μm CMOS Process and Implications for Analog Circuit Design," IEEE Transactions on Nuclear Science, vol. 50, no. 4, August 2003, pp. 915-920. M. N. Ericson, C. L. Britton, A. L. Wintenberg, J. M. Rochelle, B. J. Blalock, D. M. Binkley, and B. D. Williamson, "Noise Behavior of MOSFETs Fabricated in 0.5-μm Fully-Depleted Silicon-on-Sapphire CMOS in Weak, Moderate, and Strong Inversion," IEEE Transactions on Nuclear Science, vol. 50, no. 4, August 2003, pp. 963-968. M. S. Musrock, J. W. Young, J. C. Moyers, J. E. Breeding, M. E. Casey, J. M. Rochelle, D. M. Binkley, and B. K. Swann, "Performance Characteristics of a New Generation of Processing Circuits for PET Applications," IEEE Transactions on Nuclear Science, vol. 50, no. 4, August 2003, pp. 974-978. M. Mojarradi, D. M. Binkley, B. J. Blalock, R. Andersen, N. Ulshoefer, T. Johnson, and L. Del Castillo, "A Miniaturized, Neuroprosthesis Suitable for Implantation into the Brain," IEEE Transactions on Neural Systems and Rehabilitation Engineering, vol. 11, no. 1, March 2003, pp. 38-42. D. M. Binkley, C. E. Hopper, S. D. Tucker, B. C. Moss, J. M. Rochelle, and D. P. Foty, "A CAD Methodology for Optimizing Transistor Current and Sizing in Analog CMOS Design," IEEE Transactions on Computer-Aided Design of Integrated Circuits and Systems, vol. 22, no. 2, February 2003, pp. 225-237. M. E. Casey, C. Reynolds, D. M. Binkley, and J. M. Rochelle, "Analysis of Timing Performance for an APD - LSO Scintillation Detector," Nuclear Methods and Physics in Physics Research, vol. 504, 2003, May 2003, pp. 143-148. D. M. Binkley, B. S. Puckett, B. K. Swann, J. M. Rochelle, M. S. Musrock, and M. E. Casey, "A 10-Mcps, 0.5-μm CMOS Constant-Fraction Discriminator Having Built-In Pulse Tail Cancellation," IEEE Transactions on Nuclear Science, vol. 49, no. 3, June 2002, pp. 1130-1140. R. Lecomte, C. M. Pepin, M. D. Lepage, J.-F. Pratte, H. Dautet, and D. M. Binkley, "Performance Analysis of Phoswich/APD Detectors and Low Noise Preamplifiers for High Resolution PET Systems," IEEE Transactions on Nuclear Science, vol. 48, no. 3, June 2001, pp. 650-655. D. M. Binkley, M. E. Casey, B. S. Puckett, R. Lecomte, and A. Saoudi, "A Power Efficient, Low Noise, Wideband, Integrated CMOS Preamplifier for LSO/APD PET Systems," IEEE Transactions on Nuclear Science, vol. 47, no. 3, June 2000, pp. 810-817. D. M. Binkley and J. W. Young, "An Electronic Detector Simulator for Testing Position, Energy, and Timing Spectral Performance of Detector Electronics," IEEE Transactions on Nuclear Science, vol. 45, no. 3, June 1998, pp. 782-786. D. M. Binkley, J. M. Rochelle, B. K. Swann, L. G. Clonts, and R. N. Goble, "A Micropower CMOS, Direct-Conversion, VLF Receiver Chip for Magnetic-Field Wireless Applications," IEEE Journal of Solid-State Circuits, vol. 33, no. 3, March 1998, pp. 344-358 (invited from 1997 IEEE Custom Integrated Circuits Conference). S. R. Cherry, Y. Shao, R. Silverman, K. Meadors, S. Siegel, A. Chatziioannou, J. Young, W. Jones, J. Moyers, D. Newport, A. Boutefnouchet, T. Farquhar, M. Andreaco, M. Paulus, D. Binkley, R. Nutt, and M. Phelps, "MicroPET: A High Resolution PET Scanner for Imaging Small Animals," IEEE Transactions on Nuclear Science, vol. 44, no. 3, June 1997, pp. 1161-1166. M. J. Paulus, J. M. Rochelle, M. S. Andreaco, and D. M. Binkley, "A Low-Noise, Wideband, CMOS Charge-sensitive Preamplifier for use with APD/LSO PET Detectors," IEEE Transactions on Nuclear Science, vol. 32, no. 3, June 1996, pp. 1666-1671. J. M. Rochelle, D. M. Binkley, and M. J. Paulus, "Fully Integrated Current-Mode CMOS Gated Baseline Restorer Circuits," IEEE Transactions on Nuclear Science, vol. 42, no. 4, August 1995, pp. 729-735. D. M. Binkley, "Performance of Non-Delay-Line Constant-Fraction Discriminator Timing Circuits," IEEE Transactions on Nuclear Science, vol. NS 41, no. 4, August 1994, pp. 1169-1175. D. M. Binkley, "Optimization of Scintillation-Detector Timing Systems Using Monte Carlo Analysis," IEEE Transactions on Nuclear Science, vol. 41, no. 1, February 1994, pp. 386-393. D. M. Binkley, J. M. Rochelle, M. J. Paulus, and M. E. Casey, "A Low-Noise, Wideband, Integrated CMOS Transimpedance Preamplifier for Photodiode Applications," IEEE Transactions on Nuclear Science, vol. NS-39, no. 4, August 1992, pp. 747-752. D. M. Binkley, M. L. Simpson, and J. M. Rochelle, "A Monolithic, 2-μm CMOS Constant-Fraction Discriminator," IEEE Transactions on Nuclear Science, vol. NS-38, no. 6, December 1991, pp. 1754-1759. K. Ishii, H. Orihara, T. Matsuzawa, D. M. Binkley, and R. Nutt, "High Resolution Time-of-Flight Positron Emission Tomograph," Review of Scientific Instruments, vol. 61, no. 12, December 1990, pp. 3755-3762. D. M. Binkley and M. E. Casey, "Performance of Fast Monolithic ECL Voltage Comparators in Constant-Fraction Discriminators and Other Timing Circuits," IEEE Transactions on Nuclear Science, vol. NS-35, no. 1, February 1988, pp. 226-230. D. M. Binkley, "A Radiation-Hardened Accelerometer Preamplifier for 2 x 108 Rads (Si) Total Dose," IEEE Transactions on Nuclear Science, vol. NS-29, no. 6, December 1982, pp. 1500-1507. D. M. Binkley, J. D. Hardy, and J. W. Rizzie, "A Small Modular Isolation Amplifier for Nuclear Power Plant 1E Isolation," IEEE Transactions on Nuclear Science, vol. NS-29, no. 1, February 1982, pp. 1000-1007. S. Cho, R. A. Mintzer, J. Breuer, M. Aykac, M. Loope, J. Valenta, J. L. Corbeil, J. C. Arnott, D. Binkley, M. Roknsharifi, and S. Yuan, "Silicon-photomultiplier TOF-PET Detector," 2017 IEEE Nuclear Science and Medical Imaging Conference, Atlanta, GA, October 21 - 28, 2017. Y. Yang, D. Binkley, and C. Li, "Using Moderate Inversion to Optimize Voltage Gain, Thermal Noise, and Settling Time in Two-Stage CMOS Amplifiers", Complex Amplifiers section, 2012 IEEE International Symposium on Circuits and Systems, Seoul, Korea, May 20 - 23, 2012. Y. Yang, D. Binkley, L. Li, C. Gu, and C. Li, "All-CMOS Subbandgap Reference Circuit Operating at Low Supply Voltage," Proceedings of the IEEE International Conference on Circuits and Systems (ISCAS), Rio de Janeiro, May 15 - 18, 2011. Y. Yang, C. Li, and D. Binkley, "Continuous-time Sigma-Delta Modulator Design for Wireless Biomedical Sensing Applications," Proceedings of the 11th Annual IEEE Wireless and Microwave Technology Conference, Melbourne Beach, Florida, April 2010. C. Fayomi, D. Binkley, G. Wirth, and A. Matsuzawa, "An Experimental 0.6-V, 57.5-fJ/Conversion-Step, 250-kS/s, 8-bit, Rail-to-Rail, Successive Approximation ADC in 0.18-μm CMOS," Proceedings of the 16th IEEE International Conference on Electronics, Circuits and Systems (ICECS)," Tunisia, December 2009. D. M. Binkley, "Tradeoffs and Optimization in Analog CMOS Design," invited plenary paper, Proceedings of the 14th International Conference Mixed Design of Integrated Circuits and Systems (MIXDES), pp. 47-60, Ciechocinek, Poland, June 2007. D. M. Binkley, N. Verma, R. L. Crawford, E. J. Brandon, and T. N. Jackson, "Design of an auto-zeroed, differential, organic thin-film, field-effect transistor amplifier for sensor applications," Proceedings of SPIE, Organic Field-Effect Transistors III, vol. 5522, Denver, August 2004, pp. 41-52. Winner of a Newport Research Excellence Award. Erik Brandon, William West, Lisong Zhou, Tom Jackson, Greg Theriot, Rod A.B. Devine, David Binkley, Nikhil Verma, and Robert Crawford, "Flexible electronics for space applications," Proceedings of the Materials Research Society Symposium, vol. 814, pp. 219-230, 2004. D. M. Binkley, C. E. Hopper, B. J. Blalock, M. M. Mojarradi, J.D. Cressler, and L. K. Yong, "Noise Performance of 0.35-μm SOI CMOS Devices and Micropower Preamplifier from 77 - 400 K," 2004 IEEE Aerospace Conference, Big Sky, Montana, March 2004. D. M. Binkley, D. H. Ihme, B. J. Blalock, and M. M. Mojarradi, "Micropower, 0.35-μm Partially Depleted SOI CMOS Preamplifiers having Low White and Flicker Noise," 2003 IEEE International SOI Conference, Newport Beach, September 2003. D. M. Binkley, M. Bucher, and D. Kazazis, "Guiding the Designer in Optimizing Analog CMOS Design," invited plenary paper, Proceedings of the European Conference on Circuit Theory and Design (ECCTD) 2003, Krakow, August 2003, pp. I-8 - I-13. D. M. Binkley, D. H. Ihme, C. E. Hopper, B. J. Blalock, and M. M. Mojarradi, "Design of Micropower, Low-Noise, SOI CMOS Preamplifiers for Deep Space Environments," 2003 15th Biennial University/Government/Industry Microelectronics Symposium, Boise, Idaho, June 2003. B. K. Swann, J. M. Rochelle, D. M. Binkley, B. S. Puckett, B. J. Blalock, S. C. Terry, J. W. Young, M. S. Musrock, J. E. Breeding, and K. M. Baldwin, "A Custom Mixed Signal CMOS Integrated Circuit for High Performance PET Tomograph Front-End Applications," 2002 IEEE Nuclear Science and Medical Imaging Conference, November 2002. S. C. Terry, J. M. Rochelle, D. M. Binkley, B. J. Blalock, and D. Foty, "Comparison of a BSIM3V3 and EKV MOST Model for a 0.5-μm CMOS Process and Implications for Analog Circuit Design," 2002 IEEE Nuclear Science and Medical Imaging Conference, November 2002. M. N. Ericson, C. L. Britton, A. L. Wintenberg, J. M. Rochelle, B. J. Blalock, and D. M. Binkley, "Noise Behavior of MOSFETs Fabricated in 0.5-μm Fully-Depleted Silicon-on-Sapphire CMOS in Weak, Moderate, and Strong Inversion," 2002 IEEE Nuclear Science and Medical Imaging Conference, November 2002. M. S. Musrock, J. W. Young, J. C. Moyers, J. E. Breeding, M. E. Casey, J. M. Rochelle, D. M. Binkley, and B. K. Swann, "Performance Characteristics of a New Generation of Processing Circuits for PET Applications," 2002 IEEE Nuclear Science and Medical Imaging Conference, November 2002. 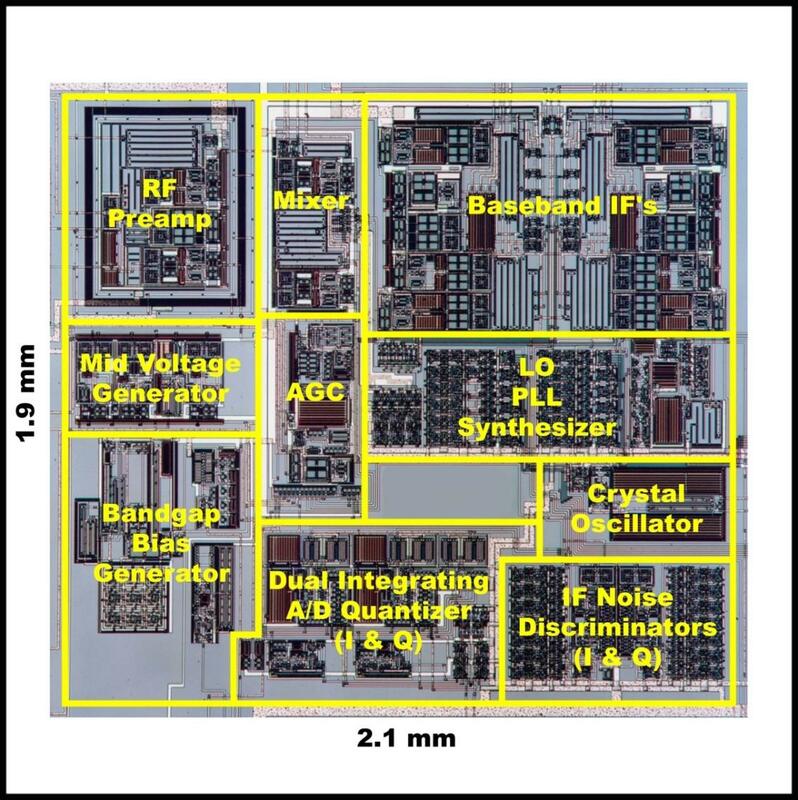 M. Bucher, D. Kazazis, F. Krummenacher, D. Binkley, D. Foty, and Y. Papananos, "Analysis of Transconductance at All Levels of Inversion in Deep Submicron CMOS," 9th IEEE International Conference on Electronics, Circuits and Systems Proceedings, vol. III, September 2002, pp. 1183-1186. D. Foty, M. Bucher, and D. Binkley, "Re-interpreting the MOS Transistor via the Inversion Coefficient and the Continuum of gms/ID," 9th IEEE International Conference on Electronics, Circuits and Systems Proceedings, vol. III, September 2002, pp. 1179-1182. S. A. Kumar, R. Z. Makki, and D. M. Binkley, "iDDT Testing of CMOS Embedded SRAM's", Proceedings of the 6th World Multiconference on Systemics, Cybernetics, and Informatics, July 2002, pp. 545- 550. M. E. Casey, C. Reynolds, D. M. Binkley, and J. M. Rochelle, "Analysis of Timing Performance for an APD - LSO Scintillation Detector," 2002 International Conference on Novel Developments in Photodetection, Beaune, France, June 2002. D. Foty, D. Binkley, and M. Bucher, "gm/ID-Based MOSFET Modeling and Modern Analog Design," (Invited Paper), Proceedings of the 9th International Conference on the Mixed Design of Integrated Circuits and Systems, June 2002, pp. 55 - 58. D. Foty, D. Binkley, and M. Bucher, "Starting Over: gm/ID-Based MOSFET Modeling as a Basis for Modernized Analog Design Methodologies," Technical Proceedings of the 2002 International Conference on Modeling and Simulation of Microsystems, Nanotech 2002, vol. 1, April 2002, pp. 682 - 685. S. A. Kumar, R. Z. Makki, and D. M. Binkley, "iDDT Testing of Embedded CMOS SRAMs," 2002 Design, Automation, and Test in Europe (DATE), Paris, March 2002, 1-page abstract, p. 1117. D. M. Binkley, B. S. Puckett, B. K. Swann, J. M. Rochelle, and M. Musrock, "A 10-Mcps, 0.5-μm CMOS Constant-Fraction Discriminator Having Built-In Pulse Tail Cancellation," 2001 IEEE Nuclear Science Symposium Conference Record, 2002. D. Foty, D. Binkley, and M. Bucher, "Measurements and Modeling of MOSFET Inversion Level over a Wide Range as a Basis for Analog Design," Proceedings of the 15th European Conference on Circuit Theory and Design, August 2001, pp. I-85 - 88. D. Binkley, M. Bucher, and D. Foty, "Design-Oriented Characterization of CMOS over the Continuum of Inversion Level and Channel Length," Proceedings of the 7th IEEE International Conference on Electronics, Circuits and Systems," December 2000, pp. 161-164. R. Lecomte, C. M. Pepin, M. D. Lepage, J.-F. Pratte, H. Dautet, and D. M. Binkley, "Performance Analysis of Phoswich/APD Detectors and Low Noise Preamplifiers for High Resolution PET Systems," 2000 IEEE Nuclear Science Symposium and Medical Imaging Conference Record, IEEE Catalog 00CH37149C (CD format), November 2000, pp. 9-77 - 81. D. M. Binkley, M. E. Casey, B. S. Puckett, R. Lecomte, and A. Saoudi, "A Power Efficient, Low Noise, Wideband, Integrated CMOS Preamplifier for LSO/APD PET Systems," 1999 IEEE Nuclear Science Symposium and Medical Imaging Conference Record, 1999. D. M. Binkley and J. W. Young, "An Electronic Detector Simulator for Testing Energy, Position, and Timing Spectral Performance of Detector Electronics," 1997 IEEE Nuclear Science Symposium and Medical Imaging Conference Record, 1997, pp. 666-670. D. M. Binkley, J. M. Rochelle, and B. K. Swann, "A Micropower CMOS, Direct-Conversion, VLF Receiver Chip for Magnetic-Field Wireless Applications," Proceedings of the 1997 IEEE Custom Integrated Circuits Conference, 1997, pp. 415-418. Full-length paper invited and accepted for March 1998 special issue of IEEE Journal of Solid-State Circuits. S. R. Cherry, Y. Shao, R. Silverman, K. Meadors, S. Siegel, A. Chatziioannou, J. Young, W. Jones, J. Moyers, D. Newport, A. Boutefnouchet, T. Farquhar, M. Andreaco, M. Paulus, D. Binkley, R. Nutt, and M. Phelps, "MicroPET: A High Resolution PET Scanner for Imaging Small Animals," 1996 IEEE Nuclear Science Symposium and Medical Imaging Conference Record, 1996, pp. 1120-1124. S. R. Cherry, Y. Shao, R. Silverman, S. Siegel, K. Meadors, E. Mumcuoglu, J. Young, W. Jones, C. Moyers, M. Andreaco, M. Paulus, D. Binkley, R. Nutt, and M. Phelps, "MicroPET: A Dedicated PET Scanner for Small Animal Imaging," Abstracts from the Society of Nuclear Medicine 43rd Annual Meeting, 1996. M. J. Paulus, J. M. Rochelle, M. S. Andreaco, and D. M. Binkley, "A Low-Noise, Wideband, CMOS Charge-Sensitive Preamplifier for use with APD/LSO PET Detectors," 1995 IEEE Nuclear Science Symposium and Medical Imaging Conference Record, 1995, pp. 330-334. J. M. Rochelle, D. M. Binkley, and M. J. Paulus, "Fully Integrated Current-Mode CMOS Gated Baseline Restorer Circuits," Conference Record of the 1994 IEEE Nuclear Science Symposium and Medical Imaging Conference, 1994, pp. 39-43. M. J. Paulus, J. M. Rochelle, and D. M. Binkley, "Comparison of the Beveled-Edge and Reach-Through APD Structures for PET Applications," Conference Record of the 1994 IEEE Nuclear Science Symposium and Medical Imaging Conference, 1994, pp. 1864-1868. D. M. Binkley, J. M. Rochelle, M. J. Paulus, M. E. Casey, R. Nutt, W. Loeffler, and J. C. Moyers, "A Custom CMOS Integrated Circuit for PET Tomograph Front-End Applications," Conference Record of the IEEE 1993 Nuclear Science Symposium and Medical Imaging Conference, 1993, pp. 867-871. D. M. Binkley, "Performance of Non-Delay-Line Constant-Fraction Discriminator Timing Circuits," Conference Record of the 1993 IEEE Nuclear Science Symposium and Medical Imaging Conference, 1993, pp. 815-819. D. M. Binkley, "Optimization of Scintillation-Detector Timing Systems Using Monte Carlo Analysis," Conference Record of the 1992 IEEE Nuclear Science Symposium and Medical Imaging Conference, 1992, pp. 263-265. B. E. Williams, D. M. Binkley, and M. E. Casey, "A Remote Gain Control for Photomultiplier Tubes," Conference Record of the 1992 IEEE Nuclear Science Symposium and Medical Imaging Conference, 1992, pp. 245-247. D. M. Binkley, J. M. Rochelle, M. J. Paulus, and M. E. Casey, "A Low-Noise, Wideband, Integrated CMOS Transimpedance Preamplifier for Photodiode Applications," Conference Record of the 1991 IEEE Nuclear Science Symposium and Medical Imaging Conference, 1991, pp. 730-734. D. A. Rhodes and D. M. Binkley, "Matrix Costing Technique for Emerging Technologies," Transactions of the American Association of Cost Engineers, 1985, pp. A.8.1-10. D. M. Binkley et al., "Signal Isolation of 1E Safety Circuits in Nuclear Power Plants," Proceedings of the American Power Conference, 1982, pp. 114-118. Y. Yang, D. M. Binkley, and C. Li, "Modeling and Optimization of Fast-Settling Time, Gain-Boosted, Cascode CMOS Amplifiers, Proceedings of the 2010 IEEE SoutheastCon, Concord, North Carolina, March 2010. J. Roberts, A. Eastridge, D. Binkley, S. Thomas, and R. Makki, "A High Speed Dynamic Power Supply Current Sensor," Proceedings of the 2007 IEEE SoutheastCon, pp. 728-733, Richmond, Virginia, March 2007. U. S. Patent Publication 20150223971 (25 claims. Notice of allowance, August 22, 2017), H. P. Zaveri, D. D. Spencer, B. Joshi, D. M Binkley, B. Lanning, and M. S. Misra, "Brain Cooling System." This patent covers a brain implant EEG sensor and cooling array, phase change cooling system, and CMOS integrated circuit to detect and suppress epilepsy by using localized cooling of the brain. Assignees: Yale School of Medicine, The University of North Carolina at Charlotte, and ITN Energy Systems, Inc.
U. S. Patent 7,710,140 (10 claims), May 4, 2010. D. M. Binkley, R. Z. Makki, T. P. Weldon, and A. Chehab, "Methods and Apparatus for Testing Electronic Circuits." These three patents cover iDDT (transient supply current testing) methods, sensors, and algorithms for testing digital circuits. Assignee: The University of North Carolina at Charlotte. U. S. Patent 7,148,717 (6 claims), December 12, 2006. U. S. Patent 6,833,724 (9 claims), December 21, 2004. U. S. Patent 7,142,167 (95 claims), November 28, 2006. J. M. Rochelle, D. M. Binkley, L. G. Clonts, B. K Swann, and R. Sangsingkeow, "Wireless Boundary Proximity Determining and Animal Containment System and Method." These two patents cover the wireless dog containment systems manufactured by Pet Safe. Assignee: XYZ Microsystems, Inc. (formerly CMS Partners and Concorde Microsystems, Inc.). U. S. Patent 6,879,300 (21 claims), April 12, 2005. U. S. Patent 6,822,506 (20 claims), November 23, 2004. D. M. Binkley, "Amplitude and Rise-Time Insensitive Timing-Shaping Filters with Built-In Pulse-Tail Cancellation for High Count-Rate Operation." This patent covers front-end analog electronics for positron emission tomograph (PET) medical imaging scanners manufactured by Siemens. Assignee: Siemens Molecular Imaging (formerly Concorde Microsystems, Inc.). U. S. Patent 5,396,187 (8 claims), March 7, 1995. D. M. Binkley, "Amplitude and Rise-Time Insensitive Timing-Shaping Filters." This patent covers front-end analog electronics for positron emission tomograph (PET) medical imaging scanners manufactured by Siemens. Assignee: Siemens Molecular Imaging (formerly CTI PET Systems, Inc.). U. S. Patent 5,367,222 (21 claims), November 22, 1994. D. M. Binkley, "Remote Gain Control Circuit for Photomultiplier Tubes." Assignee: Siemens Molecular Imaging (formerly CTI PET Systems, Inc.). D. M. Binkley, "Tradeoffs and Optimization in Analog CMOS Design," part of the MOS AK workshop, 2008 European Solid-State Device Research Conference (ESSDERC)/European Solid-State Circuits Conference (ESSCIRC), Edinburgh, September 19, 2008. D. M. Binkley, "Tradeoffs and Optimization in Analog CMOS Design," 2008 IEEE International Symposium on Circuits and Systems (ISCAS), Seattle, May 18, 2008. (This tutorial was tied with B. Razavi, "Millimeter-Wave CMOS Circuits and Transceivers" for highest attendance at the conference). D. M. Binkley, "Tradeoffs and Optimization in Analog CMOS Design," conference tutorial with D. M. Binkley (organizer), H. Graeb, G. G. E. Gielen, and J. Roychowdhury, "From Transistor to PLL - Analog Design and EDA Methods," 2008 Design, Automation, and Test in Europe Conference (DATE), Munich, March 10, 2008. D. M. Binkley, "A Methodology for Analog CMOS Design Based on the EKV MOS Model," conference tutorial with D. Foty, "MOS Modeling as a Basis for Design Methodologies: New Techniques for Modern Analog Design," 2002 IEEE International Symposium on Circuits and Systems (ISCAS), Scottsdale, May 2002. D. M. Binkley, "A Methodology for Analog CMOS Design Based on the EKV MOS Model," conference tutorial with D. Foty, "MOS Modeling as a Basis for Design Methodologies: New Techniques for Next-Generation Analog Circuit Design," 2001 15th European Conference on Circuit Theory and Design (ECCTD), Helsinki, August 2001. D. M. Binkley, "A Methodology for Analog CMOS Design Based on the EKV MOS Model," conference tutorial with D. Foty, "Re-Connection MOS Modeling and Circuit Design: New Methods for Design Quality," 2001 IEEE 2nd International Symposium on Quality Electronic Design (ISQED), San Jose, March 2001. D. M. Binkley, "A Methodology for Analog CMOS Design Based on the EKV MOS Model," tutorial given with analog MOS modeling talks by C. Enz, C. Hu, M. Bucher, and others for 2000 Fabless Semiconductor Association Design Modeling Workshop: SPICE Modeling, Santa Clara, October 2000. D. M. Binkley, "MOSFET Modeling and Circuit Design: A Methodology for Transistor Level Analog CMOS Design," conference tutorial with D. Foty, "MOSFET Modeling and Circuit Design: Re-Establishing a Lost Connection," 37th Annual Design Automation Conference (DAC), Los Angeles, June 2000. M. L. Simpson, T. J. Paulus, D. M. Binkley, and M. Paulus, "Precision Timing Measurements: Instrumentation and Fundamentals," 1995 IEEE Nuclear Science Symposium (NSS) short course, San Francisco, November 1995 (prepared notes but remained home for birth of son). D. M. Binkley, "Tradeoffs and Optimization in Analog CMOS Design," invited plenary talk for the 14th International Conference Mixed Design of Integrated Circuits and Systems (MIXDES), Ciechocinek, Poland, June 2007. D. M. Binkley, M. Bucher, and D. Kazazis, "Guiding the Designer in Optimizing Analog CMOS Design," invited plenary talk for the 2003 European Conference on Circuit Theory and Design (ECCTD), Krakow, Poland, August 2003. D. M. Binkley, "Circuit Applications for ZnO TFTs," DARPA/MTO Nano-crystalline TFT Electronics Workshop, Arlington, VA, August 2009 (at the invitation of the DARPA/MTO program manager). D. M. Binkley, "Tradeoffs and Optimization in Analog CMOS Design," all-day tutorial for the Microsystems Strategic Alliance of Quebec (members include the University of Quebec at Montreal, Mc Gill University, Ecole Polytechnique Montreal, Concordia University, and other universities and industry) and the Montreal IEEE Solid-State Circuits Society, Montreal, Canada, January 30, 2009. D. M. Binkley, "Tradeoffs and Optimization in Analog CMOS Design," Polytechnical Institute of Lausanne (EPFL), West Switzerland Chapter of the IEEE Solid-State Circuits Society, Lausanne, Switzerland, July 2007. D. M. Binkley, "Tradeoffs and Optimization in Analog CMOS Design," The Technical University of Munich (TUM) Institute for Electronic Design Automation, Munich, Germany, June 2007. D. M. Binkley, "Optimizing Analog CMOS Design from Weak through Strong Inversion," North Carolina State University Electrical and Computer Engineering Department, Raleigh, North Carolina, January 2005. D. M. Binkley, "Optimizing Analog CMOS Design from Weak through Strong Inversion," Columbia University Integrated Systems Laboratory, New York, November 2003. D. M. Binkley, "Ideas on Building the University Analog, Mixed-Signal, and Radio-Frequency Electronics Program," University of Tennessee Electrical and Computer Engineering Department, Knoxville, Tennessee, April 2003. Similar talks also given in April 2001 and April 1999. D. M. Binkley, "Ultra Low Power and Low Noise MOS Design Methodology," talk given for neurobiology researchers, California Institute of Technology, Pasadena, California, March 2001. D. M. Binkley, "Micropower CMOS Circuit Design for Mixed-Signal Applications," Center for Integrated Space Microsystems, NASA Jet Propulsion Laboratory, Pasadena, California, September 2000. D. M. Binkley, "Perspectives on University Curriculum and Research Development: Synergies with the Semiconductor Industry in North Carolina and the U.S.," University of North Carolina at Charlotte Electrical and Computer Engineering Department, Charlotte, North Carolina, April 2000. D. M. Binkley, "Overview of Analog, Mixed-Signal, and RF Industry Research Experience with Perspectives on University Curriculum and Research Development," Tennessee Technological University Electrical and Computer Engineering Department, Cookeville, Tennessee, April 2000. D. M. Binkley, "Overview of Analog, Mixed-Signal, and RF Industry Research Experience with Perspectives on University Curriculum and Research Development," Georgia Institute of Technology Electrical and Computer Engineering Department, Atlanta, Georgia, June 1999. D. M. Binkley, "Perspectives on University Research and Curriculum Development for Analog, Mixed-Signal, and RF Integrated Circuit Design," University of Kentucky Electrical and Computer Engineering Department, Lexington, Kentucky, May 1998. D. M. Binkley, "CMOS Integrated Circuits for PET Medical Imaging and Micropower, Battery-Operated Consumer Products," Virginia Commonwealth University Electrical and Computer Engineering Department, Richmond, Virginia, September 1997. D. M. Binkley, "CMOS Integrated Circuits for PET Medical Imaging and Micropower, Battery-Operated Consumer Products," North Carolina State University Electrical and Computer Engineering Department, Raleigh, North Carolina, September 1997. D. M. Binkley, "Low Phase Noise Phase-Locked Loops for Frequency Synthesis," Oak Ridge National Laboratory, September 1996. D. M. Binkley, "Design of CMOS Phase-Locked Loops," Oak Ridge National Laboratory, August 1996. D. M. Binkley, M. J. Paulus, and C. L. Britton, "Custom, Mixed-Signal Integrated Circuits Developed in East Tennessee," IEEE East Tennessee/Oak Ridge sections, October 1994. D. M. Binkley, "New Electronic Systems for ECATs of the Future," Siemens/CTI ECAT Technical Users' Meeting (for Siemens/CTI Positron Emission Tomograph users) held in Louvain-la-Neuve, Belgium, April 1994. D. M. Binkley, "Analog CMOS Modeling, and a Micropower CMOS Operational Amplifier for Switched Capacitor Filters," guest lectures for University of Tennessee graduate course, March 1994. D. M. Binkley, "Integration of Analog Electronics for PET," presentation to Microelectronics Systems Group, Electrical and Computer Engineering Department, University of Tennessee, February 1992. Biography included in Marquis Who's Who in America, 61st-present edition, 2007-present. Shout-out award with stipend, Siemens Molecular Imaging, 2017. Tau Beta Pi teaching award, "Most influential professor of 2001," for the college of engineering at UNC Charlotte. IEEE award, "For excellence in support of IEEE activities," as East Tennessee Section Chair, 1995 - 1996. IEEE superior presentation award, 1991 Nuclear Science Symposium and Medical Imaging Conference, Santa Fe. CTI/Siemens thinker award, "In acknowledgment and appreciation for the time, ingenuity, and blood that has made the ECAT (PET) Detector Electronic ASIC a successful reality," March 1994. CTI/Siemens outstanding contributor award with stipend, "Willingly given countless hours and efforts toward the achievement of this (new PET medical imaging product) goal," August 1989. Technology for Energy Corporation, three citations of excellence from the president and executive committee, 1978 - 1985. 2004/2005 graduate teaching assistant award, Steve Tucker, Ph.D. student. 2004 Newport research excellence award, Nikhil Verma, M.S. student, for the paper "Design of an auto-zeroed, differential, organic thin-film, field-effect transistor amplifier for sensor applications." Given at the 2004 Annual SPIE Meeting in Denver. 2002 UNC Charlotte Cameron center advisory board, master's research award, Norbert Ulshoefer, for the research presentation, "A Low-Noise, Micropower, CMOS Preamplifier for a 100-Element Intracortical Electrode Array." 2002 UNC Charlotte electrical and computer engineering outstanding master's student award, Adam Eastridge. "Millimeter-Wave CMOS Circuits and Transceivers," tutorial by Behzad Razavi, 2008 IEEE International Symposium on Circuits and Systems (ISCAS), May 2008. "The Craft of Scientific Writing: A Workshop on Technical Writing," short course by Michael Alley, 2004 SPIE Annual Meeting, August 2004. "Introduction to bioMEMS," tutorial by Dennis Polla, IEEE International Solid-State Circuits Conference (ISSCC), February 2003. "Highly Integrated RF and Wireless Transceivers," tutorial by Antonio Montalvo, IEEE International Solid-State Circuits Conference (ISSCC), February 2003. "Design Methodologies and CAD Tools for Mixed-Signal and RF IC's," half-day short course by Georges Gielen and Geert Van der Plas, Design, Automation, and Test in Europe (DATE) Conference, March 2002. "Metrics, Techniques and New Developments in Mixed-Signal Testing," one-day short course by Gordon Roberts, 2000 International Test Conference, October 2000. "IC Techniques for Mixed-Signal DFT and BIST," one-day short course by Stephen Sunter, 2000 International Test Conference, October 2000. "Dynamic Functional Imaging (PET, SPECT, and MRI)," one-day short course, 1999 IEEE Nuclear Science and Medical Imaging Symposium, October 1999. "High Speed Data Converters," tutorial by Klaas Bult, IEEE International Solid-State Circuits Conference, January 1999. "MOS Modeling for Deep Submicron CMOS Circuit Simulation," one-day short course by Daniel Foty, 2nd Southeastern Workshop on Mixed-Signal VLSI and Monolithic Sensors, April 1998. "Wireless IC Design," one-day short course, 1997 IEEE Custom Integrated Circuits Conference, May 1997. "Advanced Analog CMOS IC Design Techniques," one-week course by E. Vittoz, G. Temes, P. Gray, et al., MEAD Microelectronics, April 1996. "TriQuint Semiconductor GaAs Class," three-day course, TriQuint Semiconductor, April 1996. IEEE, senior member, 1993 - present. Member of the IEEE Solid-State Circuits and Nuclear Science and Medical Imaging societies. Tennessee professional engineering license, license 00015854 (inactive status as not required for work at Siemens Molecular Imaging). Paper reviews for conference and journal papers, including the IEEE Journal of Solid-State Circuits, IEEE Transactions on Circuits and Systems, IEEE Transactions on Computer Aided Design, IEEE Transactions on Nuclear Science, and IEEE Transactions on Medical Imaging. Proposal reviews for the National Science Foundation (NSF), the U. S. Department of Energy (DOE), and the National Institutes of Health (NIH). Past chair of IEEE East Tennessee Section. Past session chair or program committee member for IEEE Circuits and Systems Society, International Symposium of Low Power Electronic Design (ISLPED), and other organizations and conferences. David M. Binkley (senior member, IEEE, 1993) received the B.S., M.S., and Ph.D. degrees in electrical engineering from the University of Tennessee, Knoxville. Since 2012, Dr. Binkley is a Principal Scientist at Siemens Molecular Imaging. There he is engaged in the research and design of front-end analog and mixed-signal circuits for silicon photomultiplier (SiPM) based detectors in positron emission tomography (PET) imaging systems. Dr. Binkley is currently an adjunct professor in the Department of Electrical Engineering and Computer Science at the University of Tennessee where he teaches graduate classes in analog CMOS integrated circuit design. In 2000, following a 22-year career as an analog and mixed-signal circuit designer, Dr. Binkley joined the Department of Electrical and Computer Engineering at the University of North Carolina at Charlotte as Associate Professor and later as Professor. At the university, he was engaged in teaching and research in analog, mixed-signal, and RF integrated circuit design, receiving the Tau Beta Pi "Most Influential Teacher of 2001" award for the college of engineering. In 1992, Dr. Binkley cofounded Concorde Microsystems where he and colleagues developed custom, mixed-signal CMOS integrated circuits. These integrated circuits are in positron emission tomography (PET) medical imaging systems manufactured by Siemens and battery-operated, wireless and buried-wire, pet containment systems manufactured by Pet Safe. Prior to joining Concorde Microsystems, Dr. Binkley was a senior scientist at CTI PET Systems engaged in research and design of front-end circuits for PET medical imaging systems. In 2005, Concorde Microsystems and CTI PET Systems became part of Siemens Molecular Imaging. Dr. Binkley began his career at Technology for Energy Corporation where he developed radiation hardened, analog electronics and other instrumentation for nuclear power applications. Dr. Binkley was principal investigator on NIH grants from the National Cancer Institute while in industry. As principal investigator on university research, he conducted research for NASA JPL on micropower, analog CMOS circuits and for DARPA on design and testing methodologies for mixed-signal integrated circuits. Dr. Binkley has published over 70 papers and the book, Tradeoffs and Optimization in Analog CMOS Design, John Wiley and Sons Ltd., June 2008. He has given tutorials or plenary talks at the Design Automation Conference (DAC), European Conference on Circuit Theory and Design (ECCTD), European Solid-State Circuits and Device Research Conference (ESSCIRC/ESSDERC), International Symposium on Circuits and Systems (ISCAS), International Conference Mixed Design of Integrated Circuits and Systems (MIXDES), and Design and Test in Europe (DATE). He has also given invited talks at the California Institute of Technology, Columbia University, Technical University of Munich (TUM), and Polytechnical University of Lausanne (EPFL), and was a visiting scientist at the Institute of Electronic Design Automation at the Technical University of Munich. Dr. Binkley holds nine U.S. patents and is a senior member of the IEEE. He is a life-long electronic hobbyist, coming to the field from his hobby of amateur radio. Professional jazz pianist, composer, and arranger, having performed extensively in the Knoxville, TN and Charlotte, NC areas. Trio (piano, bass, and drums) performed at Mc Intosh, winter 2005 - spring 2007, and duo (piano and bass) performed at Harry and Jean's, summer 2004 - winter 2005, in Charlotte, NC. Performed with the University of North Carolina at Charlotte faculty/student jazz ensemble. Performed at jazz night (a promotion for the PBS "Jazz" series by Ken Burns) in Charlotte (January 2001) for the NBA game half-time between the Charlotte Hornets and New York Knickerbockers. Trio performed one night a week regularly for five years at Ivory's, and duo performed one night a week regularly for three years at Regas Restaurant in Knoxville. Quartet (tenor saxophone, piano, bass, and drums) performed four live concerts over WUOT public radio from the Knoxville Museum of Art. Quartet performed at the First Annual, Tennessee Jazz Festival in Nashville, 1999. Trio was the inaugural and repeat performer for the East Tennessee Jazz Society. Interviewed about jazz piano performances by public radio station WUOT, the Charlotte Weekly Newspaper, and the Knoxville News Sentinel Newspaper. Trio performance was featured by a Knoxville network television station in conjunction with story on the East Tennessee Jazz Society. Presented composition, Meeting At the Beach, at the 3nd International Jazz Composers Symposium, Tampa, May 2017. Recording: Gregory Tardy (tenor saxophone), David Binkley (piano), Allen Smith (bass), and Keith Brown (drums). Presented composition, Friends Through the Years, at the 2nd International Jazz Composers Symposium, Tampa, June 2008. Recording: Eric South (tenor saxophone), David Binkley (piano), Cheryl Dow (bass), and Dennis Dow (drums). President of West Forest Neighborhood Association, 1988 - 2000. Individual member of Research!America, an advocacy group for medical research. Hobbies include wildflower and scenic photography, painting, water skiing, and snow skiing.